I don't watch American Idol. I think I've seen it a few times over the years it's been on TV, and while I found it oddly fascinating, in that train wreck sort of way, the setup was sometimes also a little too close to home. As someone who spent a significant part of her formative years being taunted by people who had no business judging her, and as someone who lived in fear of the disapproval of people who did, I found the entire enterprise an unnecessary exercise in self-torture, on the one hand, and an undignified glamorization of bullying and bullies on the other. I was, it seemed, in the minority. People really loved American Idol. Viewers fell for Simon, hook, line, and sinker, crowning him the King of Snark. Maybe those who auditioned were fully complicit in their humiliation, but most of them, I think, just wanted a chance to sing with someone listening. There's been a lot of talk this week about the new kinder, gentler Idol. The judges actually pay attention to the people auditioning, even if they're not very good. They let the the most disastrous failures down gently. They offer constructive criticism. They joke with each other in ways that are friendly, not mean-spirited. J-Lo, Keith Urban, and Harry Connick Jr. seem to actually like each other; it's like they're part of some collaborative project. It's an interesting shift, ratings notwithstanding. People agree that it was definitely time for something new, and that everyone tired of the catfights of last season. But I wonder if something larger might be happening: now that bullying goes viral in a matter of minutes; now that people's careers, reputations, or entire lives, are destroyed in a series of 140-character tweets; now that everyone is an easy target, we're beginning to agree that maybe tearing people down isn't such a great idea, and more of us than we'd initially realized live in houses of glass. We've watched people get shredded in the Twitterverse, and know that there but for the grace of the Internet we go, too. And maybe we're beginning to re-think what social media is for. "I wonder sometimes whether the self-disclosure and informality of Twitter leads journalists to conclude they have different obligations to those who write on Twitter than to those who write elsewhere, because once you step outside of traditional publishing, you're in a sort of free-for-all where whatever anybody says is your own fault, because you opened your mouth"
"Twitter (like the Internet in general) is a "pull" medium, not a "push" medium; it is fed by specific and fluid choices, not longstanding trust in curation[.]" I'm not sure that I agree entirely with her point that social media is unlike an op-ed. In some ways, social media freed the op-ed: instead of relying on the Times to select them for publication, would-be opinionators were empowered to disseminate their ideas through blogs and microblogging platforms. But where at one point the medium itself seemed to invite critique, even in the writing of things like memoir, I wonder, are we becoming a kinder, gentler social public? And what does that awareness do, if anything, to the way we write and read each other's work? What is it that we're asking for when we write (or sing) in public? Every time I put something new on the table, I feel a little like I'm sitting in front of American Idol judges. My family can be pretty harsh critics. Luckily, this was pretty well recieved, even by my daughter, who plays the role of Simon Cowell. Add 1 T. olive oil to a large pot and heat on medium until oil is just shimmering. Add half of the garlic and sauté a minute or two, until fragrant but not brown. Add the spinach and continue to saute until spinach is just wilted, 2-3 minutes. Set aside in a bowl; you'll add this back in later. In the same pot, over medium heat, heat 2 T.olive oil over medium heat. When oil is shimmering, add diced onion and remaining garlic and saute 3-4 minutes, until the onion is just translucent. Add ground cumin and smoked paprika and stir until fragrant, 1-2 minutes. Add chickpeas and diced tomatoes and their juices, and continue to stir until the juices are mostly evaporated, 8-10 minutes. Add vegetable broth and farro to pot and bring to a simmer over medium-high heat, scraping up any browned bits from bottom. 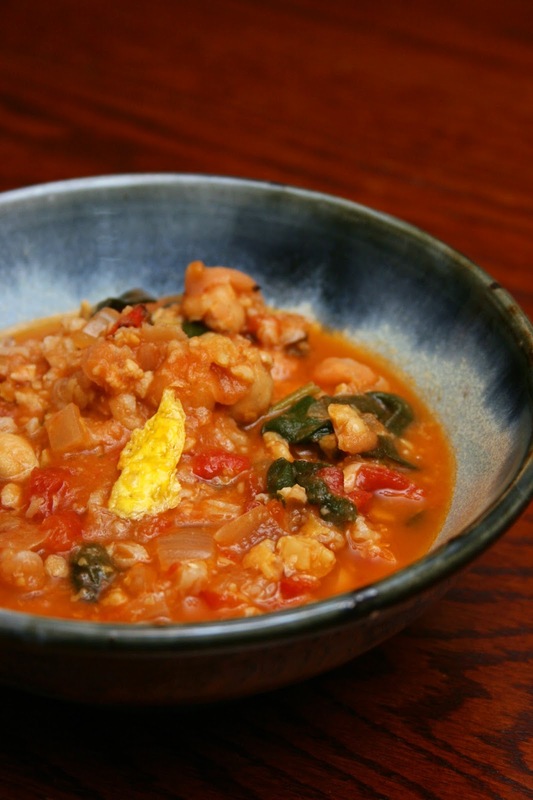 Reduce heat to medium and simmer, mashing chickpeas, until stew is thick and farro is no longer chewy, 15-20 minutes. Fold in spinach. Add water if it's too thick. If your family likes them, serve with a fried egg on top. I don't much like fried eggs, but I put a token piece on the picture, because the males in my family required it. A few of us are looking for fame or fortune or to start a row. But I think most of us are asking for a moment of connection. "Here is a thing that I have and I want to give it to you." or "Here is a feeling that I have, do you feel the same?" or "Here is a need that I have, do you have something to share?" Often those three get tangled up, of course, and an ideal personal blog, like an ideal relationship, does a mix of them. The thing to remember, of course, is that putting yourself out there is inherently risky, because we're all damaged and mean sometimes and some of us are damaged and mean a lot of the time. I too have never gotten the allure of any of these elimination shows, especially the ones based on talent. Josh likes to watch Chopped, but I find it really hard to watch people being rejected, publicly. And they're always kind on that show as they reject the person. But still. Wow, how I wish I could think you are right, that the culture-shift of American Idol might represent a broader change. Maybe... after all, even Glenn Beck did just sort-of apologize for his work on Fox (http://www.nytimes.com/2014/01/25/opinion/the-penance-of-glenn-beck.html?hp&rref=opinion). But then I read about some retired cop shooting a guy in a movie theater because he was texting during the PREVIEWS. Breaks my heart. This is a very timely post for me. I think in a way you have nailed it, that our very viral world has shifted our behavior in certain ways - at least for those who are aware of this. I have shelved many blog posts lately that I feel may be "too controversial" for someone who is about to hang out a shingle and try to sell stuff to the nation at large. And while I don't have a huge blog audience, I "could" have a huge blog audience in a manner of minutes. One never knows in this viral world. I'd like to think that AI reflects a general trend toward kindness, but I still see too much schadenfreude. More so on the Internet than IRL. I don't think I've watched an episode, either. Because this: "it's an undignified glamorization of bullying and bullies."